When you are looking to carry around all of your zombie outbreak equipment, whether its weapons, medical kits, survival gear or more, look to the Dead Are Among Us Tote Bag to make carrying all those different items that much easier. This canvas tote bag is made from black canvas and is designed to make carrying bigger loads easier. The bag features two straps for carrying, while the front features a zombie graphic. The graphic depicts a decomposing zombie face at the center, while two concentric circles wrap around the zombies head. Within the upper part of the circles is the phrase, The Dead Are Among Us! The word Zombie is printed in big, bold letters just beneath the zombies chin, while in smaller print are the words, We are coming to eat you!!! The bag measures 16 inches wide by 16 inches long. 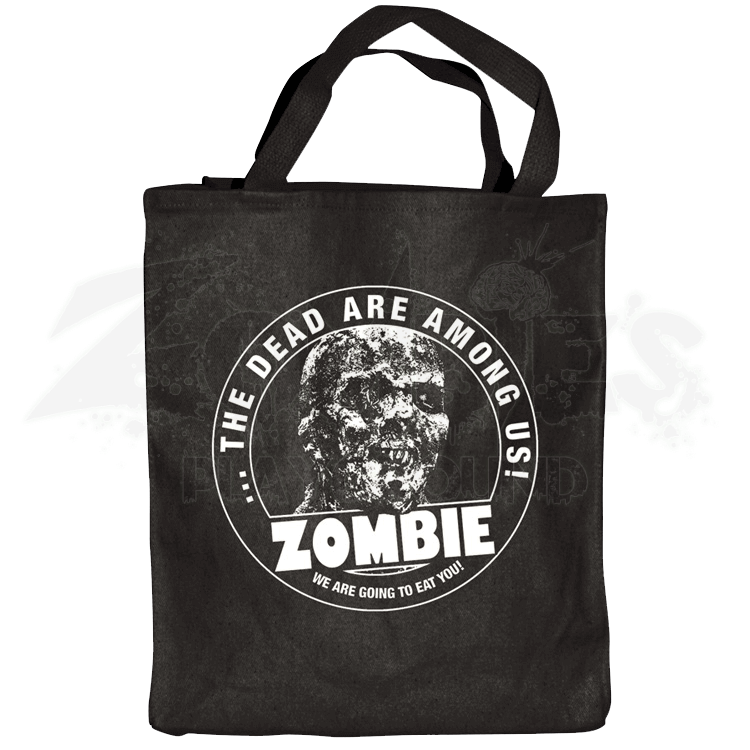 The Dead Are Among Us Tote Bag is a fantastic way to carry all manner of things, whether you are lugging around books after class, groceries after a trip to the store, or weapons and goods after the dead rise from their graves.